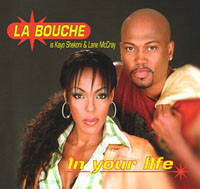 “In Your Life” was a previously unreleased track that was released as a single in memory of La Bouche’s vocalist Melanie Thornton, who died in a plane crash in late 2001. 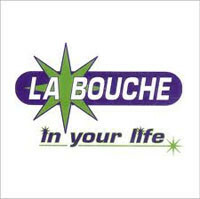 The song itself sounds like a “typical” La Bouche track; in some ways, it’s reminiscent of “Be My Lover” and “Sweet Dreams.” In the U.S., two different pressings of the single were issued. This review starts out reviewing the first pressing of the single, which was a maxi-single with four remixes. Then, I’ll take a look at the second pressing of the single. The one drawback to the maxi-single was the fact that neither the original version nor a radio edit of the original was included. The single opens with an extended mix of “In Your Life,” which is an extended version of the original song. It’s a rather straightforward extended version; basically, it just takes the original song and extends out the music to make it longer. Next is the “DezroK Club Mix,” which is the longest mix on the single. This mix incorporates a harder bassline, and echo effects are occasionally used on the vocals. The mix itself isn’t bad, but it’s a little on the lengthy side. This mix would have been better if it was shorter. I wish the mix was either shorter, or that a radio edit of this mix had been included instead. The next mix is the “Shane 54 Vocal Mix,” which has a harder bassline than the original; it’s also a faster tempo. There is a lot of echo on the vocals, which are also occasionally distorted. The main problem with this mix is its length; if the ending was cut down by about a minute, then I would enjoy listening to this mix a bit more.. The final track is “The Xquizit DJ X Remix,” which has the vocals processed and pushed to the back of the mix in the intro; during the mix, the processing done to the vocals during the chorus become annoying rather quickly, and the ending just went on for too long. This is a more “synth-based” mix than the others; however, this is easily the weakest mix on the single. A second single for “In Your Life” was issued in the U.S. about three months later, and it contains edits of three of the mixes that appeared on the original maxi-single. The first track is the “DezroK Edit,” and this edit solved the problem I had with the length of the original mix. I really enjoyed the mix a lot more after hearing this edit. The second track on the disc is the “Original Edit.” It’s good to see that the version of the song that was promoted to radio was finally made available commercially in the United States. However, it’s puzzling why it wasn’t the first track on the single. “The Xquizit DJ X Edit” makes the original mix sound tolerable, but it’s still the weakest remix that I’ve heard for “In Your Life.” However, it appears that the processing done to the vocals on the original mix isn’t as prevalent on the edit that’s included on this pressing. I wrote this review after listening to both pressings of the “In Your Life” single that my husband and I purchased.